this would be their first high-altitude test. Caught a draft and soared. Carbon nanofiber “feathers” gripped the air like magic. Pain in one of the appendages. I love it …i think maybe we both spent some time thinking out physics and maybe the spiritual aspects of down? we work in similar circles my friend. Terrific flash! Leave a link to your blog in The Green Room at the top of M3. I will send you a care package. Welcome to FTP! Thanks, I will do that ASAP. 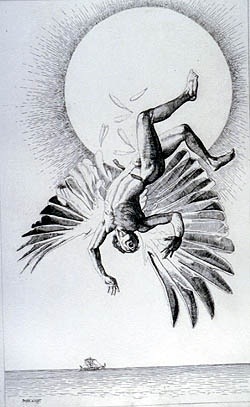 You know, when I graduated high school I went to get a tattoo of Icarus on my back. That Landscape and the Fall of Icarus was my favorite painting, my favorite poem that inspired it. Luckily I gave it up as a bad idea otherwise I might have learned to hate ol’ Icarus! Yeah, why Icarus? It’s a good tale, but sort of an oppressive cautionary one if you ask me. It was the painting…The Landscape and the Fall of Icarus. I loved it. It hung in my room, then my dorm room and now my house. There is something about the painting that brought light to such a cautionary tale. It was funny, it was also the beginning of the mythology obsession for me. It’s better than fairy tales. Lol I am a huge mythology buff from childhood! Are you talking about that landscape with Icarus falling in the background where the casual observer almost wouldn’t notice him? With just his feet in the water on the bottom right? I don’t recall for certain but that’s ringing a bell. Seems insane it on a documentary or something. Unleash the power of the internet…Google it! Plato once argued that writing would be the death of the oral tradition, and in large part that came to fruition; if I were to just unleash the power of the Internet, how could I ever hope to harness the power of my own mind? Ok I’ll go look at it now. It’s a bit early for Plato isn’t it? Lol I’m trying to get on a run for what it’s worth! That’s the painting alright, but I can’t find him in the picture. In the water in front of the ship. There are a fluff of feathers around him. Oh yeah, thar he be! I seem to be great at missing the obvious. I’ve been up since 4pm yesterday – so I guess it’s a bit late for Plato, no early! The All Night Knitter isn’t just a gimmick. I really just don’t sleep that much.